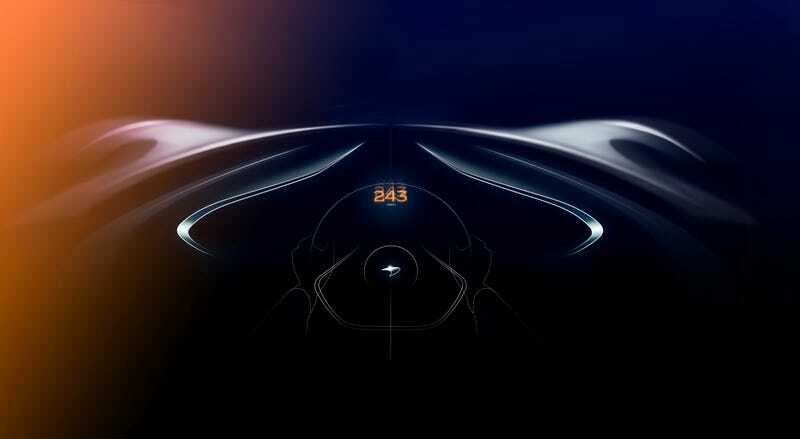 Earlier this week we learned that the upcoming three-seat McLaren BP23 will be crazy fast—faster than even the legendary McLaren F1 was. Now the mad scientists from Woking have unveiled two important numbers: 243 and 106. The first one is the top speed, which at 243 mph exceeds even the F1. The second is the number they’ll make: only 106. Also, they cost £1.6 million (about $2.2 million U.S.) and they’re already sold out. Sorry! The BP23 ‘Hyper-GT’ itself will be a tribute to the F1. It will have a three-seat layout like its grandfather, and the 106 produced matches the old car too—only 106 F1s rolled of the line in the time we call “the 1990s.” It was a dark time—lot of acid wash jeans—but the cars were good. Now, the Senna and Senna GTR have been released to the world, hybrid free, and are just one part of the whole “Ultimate Series” thing. The idea behind it all is be the right car for a given situation—the Senna for the track, BP23 for the road. Essentially, the Senna’s there to get you around the track in the best way possible, and the BP23 will get you from lapping Spa to your yacht in Monaco in greater luxury, and at greater speed apparently, in the best way possible as well. There is no one tool for any given job; you don’t use a skillet to ice a cake. I mean, it may be possible but you can do it better with one of those icing bag things. You get my point. Each of the 106 cars will be bespoke to its owner and will come with McLaren Special Operations’ delicate touches. The F1 was an incredible piece of engineering, one that set a very high bar for what could be done. Nowadays there are many promises of super high top speeds and incredible comfort, sure, but McLaren has remained tight lipped on whether it would try and beat its own record. Now, it seems, it is. You have to wonder whether the team at Bugatti is clenching its collective asses about the news, and we’ll find out later on whether they need to.